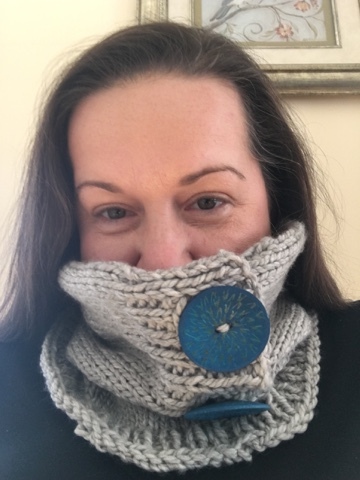 I finished the Cambrian Cowl and just in time considering the upcoming snow storm. It is knit in Cascade Yarns 128 super wash in the color way called Silver. This was a discount skein of yarn that I bought on an impulse. 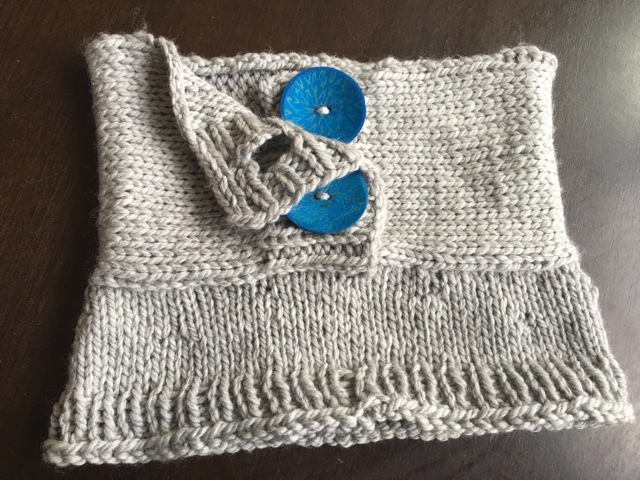 Ok, so really, it's not hard to get me to buy bulky soft yarn in gray. 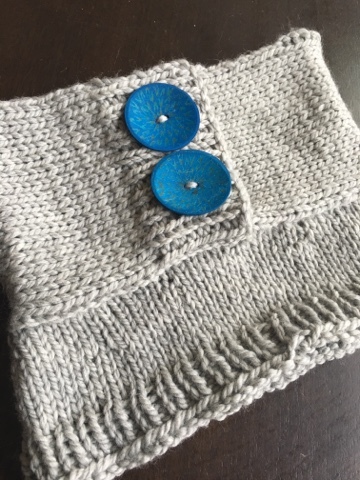 I love gray so I'm going to always find a reason to get more gray yarn. It just so happened that this yarn was perfect for the project. The story is I went to the local yarn store to pick up a skein of yarn to work on another baby gift project. At the checkout the book where this pattern came from was on display. I knew right then that I needed that book! It took me 3 seconds of flipping through it to determine that the book was going to be a welcome addition. Anyhow I had noticed the gray yarn in the discount basket and added that to my pile. The most difficult part of any of my projects being fully finished is always the quest for buttons. I am drawn to statement buttons, particularly if the project has only a few buttons. In those circumstances I see the buttons as adornment to highlight the hand made garment. The trouble I was having was size. 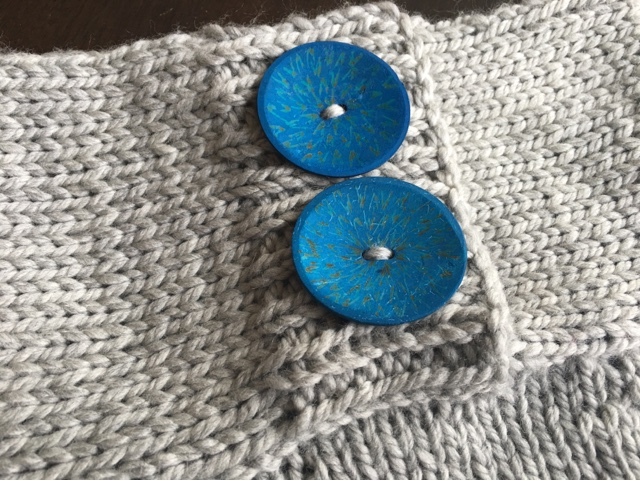 I needed GIANT buttons for this cowl. I had no luck at the nearby yarn store. They tend to not carry many interesting to me buttons. Their stock tends to lean towards the cute, utilitarian, or boring old fashioned. Some old fashioned buttons can be amazing but these they stock, they are not. Mostly they look more like buttons that belong on something drab. I found these giant blue buttons made from coconut shells at another sort of local yarn store. It's a store that I have been recently visiting, a bit further away, but the people are so nice and really with it when it comes to the knitting/crochet community. Of course they are because they carry a good variety of buttons and they really have a nice eye for the statement buttons. I love these buttons! At first I thought they would be too big. I am so glad they ended up being the only ones big ENOUGH! The coloring reminds me of peacock feathers. I don't know who made them, if these are some hand made buttons the store sources, I didn't think to ask. All I know is that at first sight I knew right away they were just what I was looking for to add some jazzy flare. Now I'm ready for that snow storm to come along. New cowl ready to wear I'm hoping for a few good cold days.